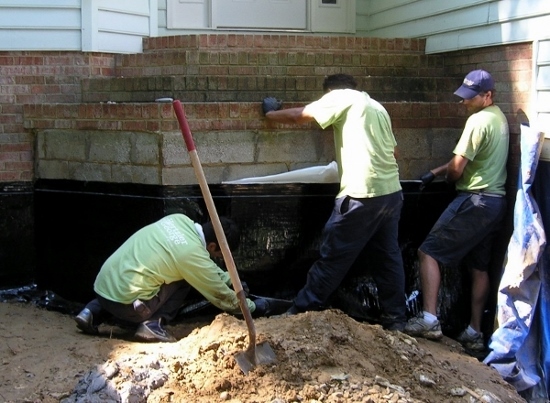 Foundation drainage issues are something we come across quite a lot on our landscape projects. The clay soils in the Tidewater area are terrible for water drainage. And in the past, home builders weren’t as careful about grading around houses as they should have been. In many cases, houses actually ended up acting as dams, blocking water from moving across the property and trapping it close to the house. Not a good situation to find yourself in! For example, take this house in Williamsburg. The owners had asked H&G to create a more spacious landing at the front door, but a bit of poking around revealed larger issues that needed to be addressed. The efflorescence we came across on the concrete blocks in the partially buried garage was as sure sign of trouble (see arrows below). And the garage didn’t pass the sniff test. 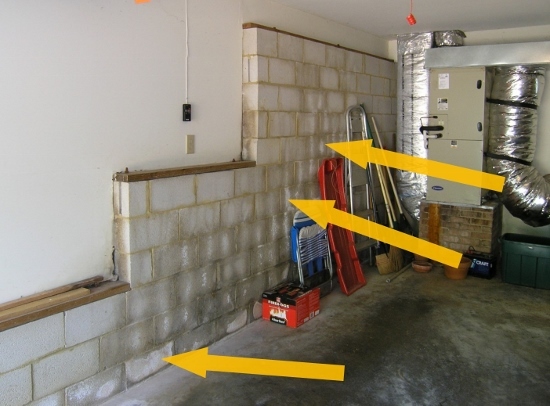 A musty odor in basements or crawl spaces is a sure sign of drainage problems. 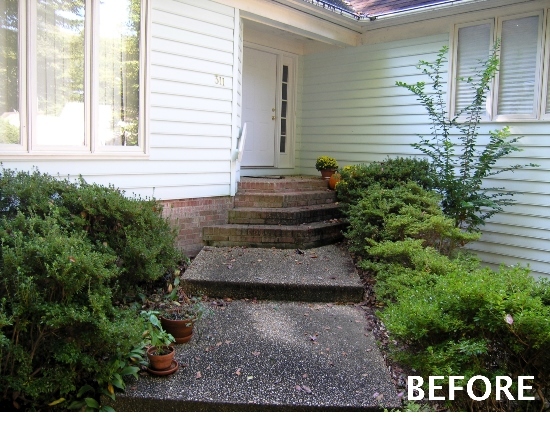 The problem with this house was the steep front yard. To get a walkway to the front door, the original builders had to construct retaining walls and pile soil against the foundation of the house. 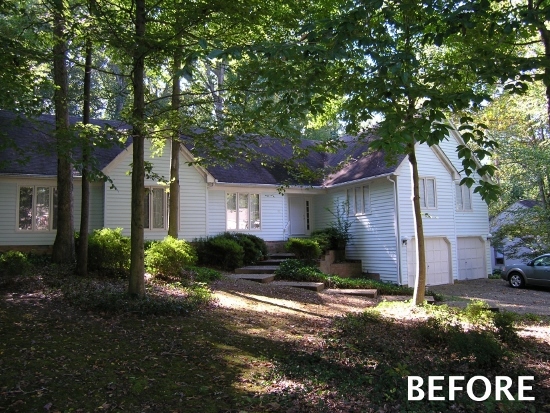 In doing so, they made the grade outside the house higher than the grade inside the crawl space and garage. Concrete blocks by themselves don’t make an effective water barrier. Water doesn’t have too much trouble finding its way through the masonry joints as well as being absorbed by the blocks themselves. Without a sufficient drainage system in place, it was only a matter of time before damage started to occur. Brick masons will tell you, with constant water exposure, concrete blocks will start to break down. So our new task became: how can we find a way to prevent major structural damage to the foundation? The walls had to be waterproofed. So we decided to excavate around the foundation and apply a sheet membrane in combination with drainage panels to provide a way for water to escape. For residential waterproofing there a couple options to consider: liquid membranes and sheet membranes. 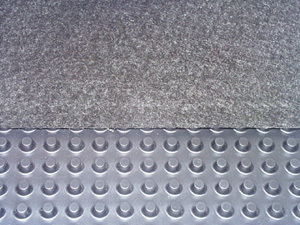 Liquid membranes are sprayed or rolled on. While a liquid membrane is less expensive and easier to install than sheet membranes, it is not as forgiving if small cracks appear in the walls. And while liquid membranes might be good for small or hard to reach areas, they did not seem up to the task for this particular job. Sheet membranes, the option we chose, are large, very sticky peel and stick sheets made from rubberized asphalt that are applied to the wall. And though I call them peel and stick, they are actually a heavy duty application that requires a bit of skill and practice to get them placed correctly. One benefit of sheet membranes is that they have some elasticity to them, so if small cracks do appear, it won’t affect the integrity of the membranes. With either system, you need to install drainage panels for the best result. Drainage panes are dimpled boards that provide spaces for water to run down to a drain pipe at the bottom of the panels. They are installed next to the waterproof membrane, and soil is back-filled against them. 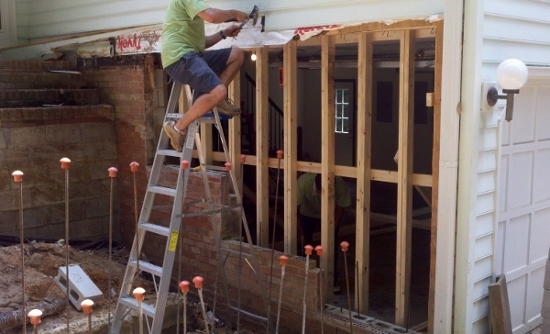 Luckily, the foundation under the front door was in fairly decent shape, and were able to cover it with the sheet membrane, but at the garage, we had to remove the existing damaged blocks and install a membrane on totally new wall. We also had to replace some of the framing damage caused by water being drawn up from the damp concrete blocks. When the whole process was finished, the new retaining walls that Hertzler & George designed and constructed provided the clients with a much more gracious front entry. And the waterproofing and drainage system hidden below the landscaping will protect the house for years to come. 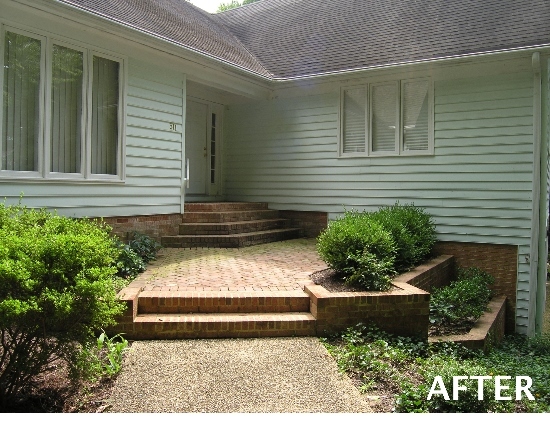 That’s the advantage of choosing H&G for your landscape construction project. Other companies may simply have installed new landscaping and ignored the drainage issues, or they may have waterproofed the foundation but they wouldn’t have had an eye for designing an attractive landscape. 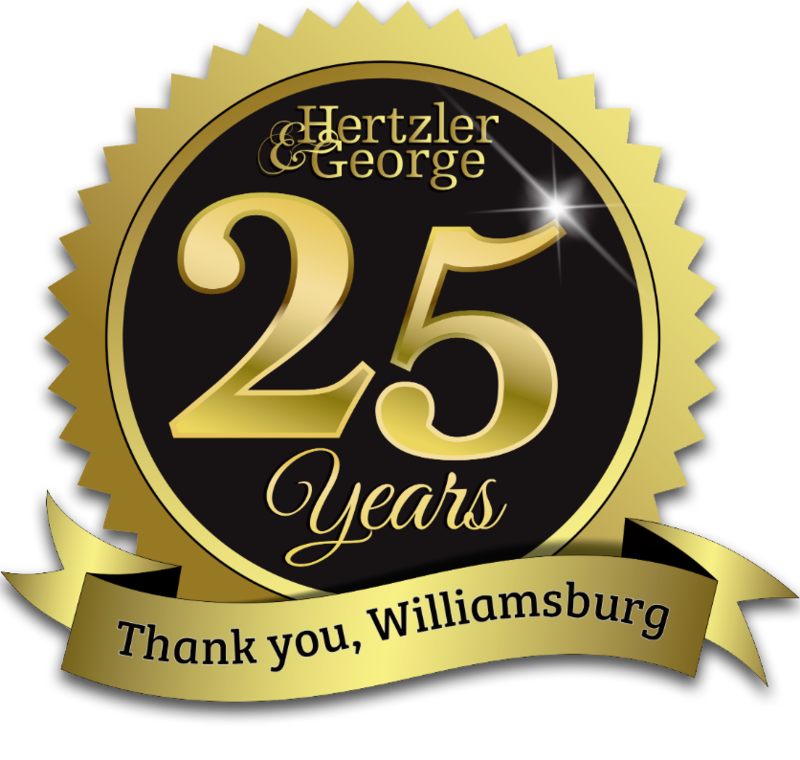 Only Hertzler & George brings all the elements together for an truly outstanding project!